The Roman Catholic Church’s toxic obsession with homosexuality manifests itself in countless ways. The most recent anti-gay outburst came from the Chicago Archbishop, Cardinal Francis George, who foolishly compared the LGBT community to the Ku Klux Klan. George’s offensive remarks came during a dispute over the scheduled starting time of the annual LGBT pride parade. The June 2012 event was originally set to begin at 10am, but a priest bitterly complained that this would interfere with morning services. 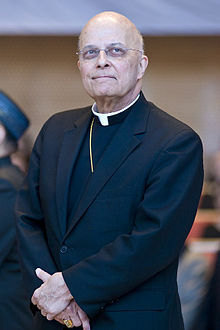 Cardinal George’s outrageous comparison of the LGBT community to the Ku Klux Klan was so degrading and hurtful that apologizing will not be sufficient. He has crossed so far over the line of basic decency that he couldn’t see it with a pair of binoculars. His only road to redemption is handing in his resignation. If George has a shred of dignity and a sliver of class he will immediately step down. To help influence his decision my organization, Truth Wins Out, launched a petition that has already been signed by more than 4,000 people. First, bringing the KKK into a logistical discussion over a parade’s starting time is as brazen as it is bizarre. Especially, when the problem had already been resolved in good faith by changing the jump off time to noon. With no logical reason to bring this hate group into the mix, it is fair to assume that the nasty analogy was a cheap shot and a low blow designed to slime the LGBT community. If George’s intention was to play demagogue by unfairly pairing the LGBT community with vile imagery, he should have simply gone all the way and thrown in the Nazis, Charles Manson, Jim Jones, and Osama bin Laden. These odious examples would have made as much sense as the Klan comparison. Second, how does one compare a peaceful movement of non-violent tax paying families to a group with a unique history of terror in the United States? Can the good Cardinal provide examples of masked homosexuals showing up at Catholic Churches and burning crosses or other objects on their lawns? Can George show us evidence that LGBT people are lynching people of faith? Are their choirboys and nuns hanging from trees that we don’t know about? Apparently, he can’t back up his irrational position and this is why he refused to appear on Chicago’s WGN radio to discuss his remarks, as I did on Tuesday morning. Third, George falsely claimed that the LGBT parade was about “demonstrating in the streets against Catholicism.” This far out assessment is simply paranoid and delusional. While the rabidly homophobic positions of Rome have rightfully angered many LGBT activists, the vast majority of parade marchers and spectators don’t go to make a political statement, but to have a good time. Such parades also include a large number of LGBT Catholics and organizations that represent the gay faithful. It is a mark of George’s solipsism that he thinks we are as obsessed about the Roman Catholic Church as it is about our lives. Despite the Vatican’s best efforts to harm our families, most LGBT Catholics choose to follow the lead of their straight counterparts and ignore the more medieval and extreme proclamations from Rome. I’d like examples of where George was prohibited by the LGBT community from worshiping. Of course, he won’t provide any – because this is more about George’s dishonesty and hyperbole than it is about reality. At this point, the best George can do is to proclaim that he meant to say “gay, gay, gay” and it mistakenly came out KKK.